South Africa braces for a tough budget speech Wednesday amid renewed optimism spurred by the country's new reformist president who has promised to drive the economy out of the doldrums. Cyril Ramaphosa took over last week from the scandal-plagued Jacob Zuma, raising hope for a turnaround in the economy that slid into recession in 2016 and has grown only tepidly since. Ramaphosa's appointment was greeted in currency, stock and bond markets, but his administration is having to work from a low base. South Africa, the most advanced economy on the continent, over the past nine years under Zuma experienced subdued growth, ballooning national debt, decreased investor confidence, record unemployment levels averaging 27 percent and bond downgrades to junk status. "It's going to be the most difficult budget in our post-democratic time," said Piet Naude, a professor at the University of Stellenbosch Business School. Growth ticked to 0.9 percent last year from a paltry 0.3 percent the previous year. Analysts forecast this year's growth will jump to 1.8 percent. The government will have to raise at least 30 billion rand ($2.6 billion) from taxes to finance, among other things, free university education for students from low income families - a policy abruptly announced by Zuma on the eve of his departure from the ANC presidency last year. "This is going to be a very tough budget," warned University of Cape Town professor Co-Pierre Georg. Under intense pressure to remove a number of ministers closely allied with Zuma and blamed for aiding state corruption, Ramaphosa told lawmakers on Tuesday that he will announce a new cabinet at an "appropriate" time. Ramaphosa also pledged to trim the bloated government. The first target is likely going to be the Finance Minister Malusi Gigaba, whose removal MPs have been clamouring for in the run-up to the budget speech. Minister Gigaba "has this tainted history and the problem with him delivering the budget is that people know that he has been involved so intimately with the state capture project" and "cannot signal to international markets a credible turnaround," said Georg. Since Ramaphosa was sworn in as president the rand has strengthened, the bond market is at its best level in almost two years and the equity market rose nearly four percent on Friday when Ramaphosa delivered his maiden state of the nation address. "The markets believe Ramaphosa is good for our economy," said Ken Swettenham, a financial analyst with Liberty Life. "There is positive sentiment." But the opposition is skeptical. 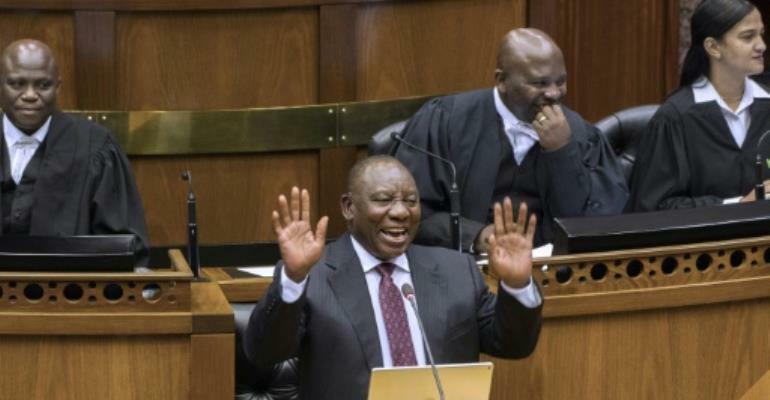 Ramaphosa "has made some bland, very nice sounding statements about what he is going to do, but the proof is in the eating of the pudding," said opposition Democratic Alliance's shadow finance minister Alf Lees. Forecasters expect inflation to remain below four percent this year.